Hello again, Gameologerinos. For our open thread today, I checked back in with Thomas Bloomquist. He works on the ad side of the Onion, Inc., operation, and he’s the office’s biggest fan of the strategy game series Civilization. Readers with extraordinary recall might remember Thomas from a WAYPTW? earlier this year, when he shared his experiences with Civilization V and its Brave New World expansion. With the recent release of Civilization: Beyond Earth—a futuristic spin-off along the lines of the 1999 game Sid Meier’s Alpha Centauri—I decided to bring Thomas back to get his initial impressions of the new game. As always, share your weekend gaming plans in the comments. Thomas Bloomquist: This weekend, I’m playing Civilization: Beyond Earth. JT: Was this a day-one purchase for you? I know you’re a big Civ fan. TB: Yes, I pre-ordered after seeing the first teaser trailer. I’m a sucker for that. Same thing happened with Grand Theft Auto V. Although for both, I would have likely bought on the first day anyhow. JT: What are the big changes in Beyond Earth from previous Civ games? TB: I’ve noticed that there are fewer civilizations to choose from, although each have the standard “perk” [bonus] toward the civ you pick. You can also customize your layout. So, say I’m going to be the Pan-Asian Cooperative or Slavic Federation—I’m still able to choose if I want to lean toward health (energy, for some reason) and/or culture. Or if I want to start out with a free tech to expand quickly. Or just choose a worker or soldier. I think it adds a unique touch where the civs are more balanced, as opposed to the many past Civilization games where civilizations’ perks are vastly different from each other. Also, the “web” for the tech tree adds a non-linear feel, but I find it a bit overwhelming. My biggest gripe in this change is that you can’t just continue to research one end of the web. It almost punishes you, makes it more difficult, to be overpowered in one particular area of research, while ignoring the rest. JT: I love that you go straight to the nitty-gritty. Why is it called Beyond Earth? TB: Because we, as civilizations, go beyond Earth to survive. They really should have tied in either a Back To The Future, Doc Brown-style, “Marty, we have to go beyond Earth!” cutscene or a Chris Nolan Interstellar tie-in, but so it goes. JT: So the goal is to get the hell off the planet? TB: You’re already off, due to some “great mistake” on planet Earth. This is only in the knowledge index—I believe they call it the “Civopedia.” The funny thing is, you start off in the year 2260-something, and yet you still need to research biology, and physics—the basics—on your new planet. Because somehow, you mastered interstellar travel without these basics. JT: Why would you need physics to reach a new planet? Just eyeball it. Planets are big, you’ll probably get close enough. TB: Maybe the goal is to research the physics and biology of your new planet. But I would assume that physics would apply everywhere, if Neil DeGrasse Tyson’s Cosmos has taught me anything. JT: Would you recommend Beyond Earth to our readers as a weekend diversion? TB: Yes, of course. I would say that if you’re a fan of the series, you may have already bought this game. If not, I think you will have the same learning curve as the rest of us. 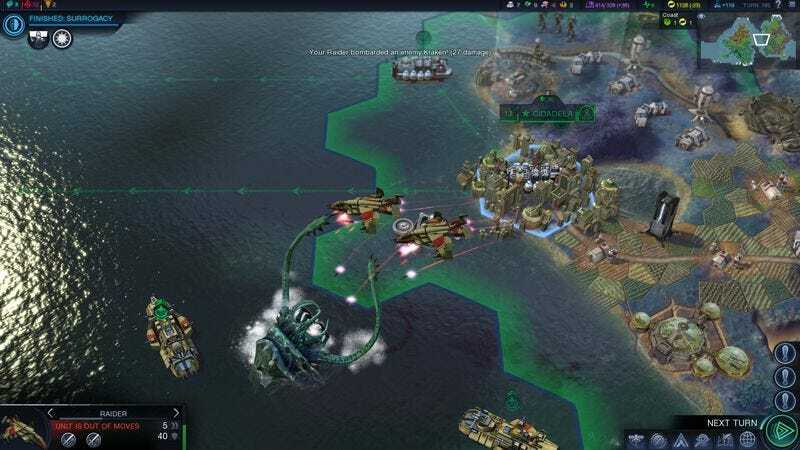 It definitely isn’t a “re-skinned” Civ V. Although I have preferred Civ V, especially with Brave New World, I would say that this one definitely stacks up as tough, and it’s something I’ll find myself enjoying as they patch and fix a few minor issues. JT: Will you ever tire of Civilization? TB: My immediate answer was “yes,” even as I find myself playing console games less and less. However, I think it ebbs and flows. As long as the game is fun and continues to innovate, I’ll still find it worthwhile, though probably just in smaller doses. JT: If you could only have one Civ for the rest of time, which would it be? TB: Civ V with Brave New World. Very addictive and fun.